It is with great pleasure that the Fondazione Palazzo Coronini Cronberg of Gorizia announces an important discovery made in its library collections and related to the Renaissance history and culture. The bibliophile and book historian Duilio Contin has in fact discovered among the manuscripts and antique books gathered by Count Guglielmo Coronini a document dating from the end of the 15th C and considered lost for centuries: it is the manuscript of the famous mathematician Luca Pacioli (1445c.-1517c.) called “Game of Chess”, often mentioned in bibliographical documents but never found. This manuscript called by the author “De ludo scacchorum ...” and known as “Schifanoia” was dedicated to the marquise of Mantova, Isabella d’Este. During his research commissioned by the Centro Studi of Aboca Museum of Sansepolcro concerning bibliographical studies on Pietro della Francesca and Luca Pacioli (both born in the Tuscan town), Duilio Contin had applied to the prestigious Fondazione Coronini Cronberg of Gorizia to examine the rich library containing more than 22,000 volumes. 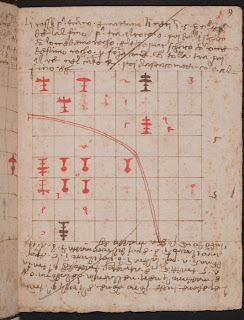 Only by chance Serenella Ferrari Benedetti, cultural co-ordinator of the Fondazione, drew Contin’s attention to the anonymous manuscript on the game of chess, in which several scholars had been interested, ignoring it was Luca Pacioli’s most researched book.